Detekix who are now known as Quest, are making waves in the metal detecting world recently. With the release of the Quest Q20, Q40 & Quest Pro metal detectors and their universal wireless metal detecting headphones, both being well received it’s fair to say that their popularity is increasing at a rapid rate! In this post, we are going to be taking a closer look at both of the Deteknix/Quest XPointer pinpointers. There are 2 pinpointers by Deteknix the XPointer standard and the XPointer Pro. So I thought we would just cover them both together in one place so you can make the decision on which is best for you. We will do a comparison at the end of this post to see what differences there are. What do you get with the Deteknix XPointer PinPointer? So what’s in the box? The Deteknix XPointer Pinpointer comes with a belt holster and Lanyard. Meaning you can holster it when you’re not using it and carry it around with you safely without worrying about it falling out. The holster is black and orange and is made from a good durable material which fits the XPointer in nice and snug, but not too snug as to cause problems trying to get it out, it comes out of the holster with ease. It’s also got an end cap that fits over the tip to protect from damage. The first thing you’re going to notice about the Deteknix XPointer is the bright orange colour. Its body is predominantly bright orange with a black bottom and two black buttons. The 2 buttons are located in the centre of the pinpointer. One is for switching the pointer on and off and the other is for mode selection. It has a built-in internal speaker and a bright LED light for increased visibility while searching in the hole to locate a target. It’s approximately 9 inches long and weighs a small 240 grams (without the battery) so you’re not going to find it gets in the way or is too bulky. The XPointer takes 1 9 volt battery which is placed inside the bottom end of the pointer by unscrewing the black bottom compartment. Unfortunately not fully waterproof so don’t try and submerge the XPointer in the water, however, it is water resistant meaning it can be used in all weathers and you don’t have to worry about the water getting inside the pointer. With 4 levels of sensitivity, the XPointer can be set to the level that suits the conditions best. You can use the PinPointer in audio only, vibration only or you can set it up to use both audio and vibration alert when you are near your target. These alerts intensify the closer you get to the target. It also has low battery warning and “find me” mode where it will beep after 3 minutes if you have lost it somewhere while detecting. The Deteknix or now known as the Quest XPointer comes with a 2-year warranty. Wow. The reviews on this pinpointer are fantastic. I have not personally used one, that being said a detecting buddy of mine swears by his and the reviews you’re going to find on the internet will confirm what I am about to tell you. There are literally over 70 positive reviews on Amazon, take a look for yourself. The Xpointers manufacturers underestimate the depth capabilities by quite a lot, it’s more powerful than what they state. Its a very stable pinpointer with no falsing reports and I’m yet to see anyone unhappy with their Xpointer. A very simple to use metal-detecting pinpointer, that performs with stability and power, and at a very very good price. Making the XPointer a fantastic choice for beginners and seasoned detectorists alike. Quest Metal Detectors are really up and coming in the detecting world and it’s because of their reliable products that are well received by all. To summarise if you’re working with a budget and you want a very good honest, reliable but powerful pinpointer then I would highly recommend it. The XPointer Pro is the big brother of the standard XPointer and for those who have a little more of a budget to play with. It’s not a great deal more cost-wise but is it worth the extra? Quest wanted to create a pinpointer that would compete with the likes of the Garrett ProPointer AT and other big names and you’ve only got to look at the reviews and feedback to see that they have really succeeded. A year or 2 ago Quest was an unknown brand, formerly known as Deteknix who did have a small following. They’ve created a few products that have been very successful and the XPointer PRO is one of them. 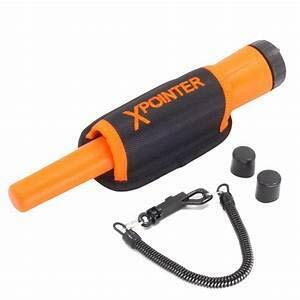 The XPointer PRO is an upgrade of their XPointer Wader Li model. What do you get with the Deteknix XPointer Pro Pin Pointer? When you purchase the XPointer PRO package it comes with a belt holster and lanyard. You’ll also receive the AC charger and a USB charging cable. Yup that’s right it has a built-in battery for USB charging. There’s a hard shell protective case available which is intended to protect excessive wear of the tip but this does not come as standard you will have to purchase this separately. Bright orange in colour you really can’t miss it. It has a ribbed body with an anti-slip structure and is ergonomic in design making it very comfortable to hold. Very sturdy and well built in my opinion. You’ll find the buttons in the centre of the body and the LED light is located in the centre also. It’s very lightweight at 200 grams. 25 cm in maximum length with a 9.5 cm detection tip. The XPointer Pro is fully submersible up to 60 meters making this pinpointer completely waterproof and perfect for all conditions. A fantastic choice of pinpointer for the beach, snorkelling, in heavy rain, wading or for on land. With a built-in 3.7v 500mAh Li Poly battery the Quest X-Pointer Pro is charged by USB cable, no more paying out for batteries and if you grab yourself a car charger you won’t have to worry about running out mid-hunt. The XPointer Pro by Quest has 4 levels of sensitivity along with both audio and vibration alerts you can run these individually or simultaneously. Light up the hole or spot that you are searching with the built-in LED flashlight. The pinpointers LED will start to flash when you are running low on battery, don’t worry though it will still work just will decrease slightly in sensitivity. It also has a lost alarm which will beep to alert you as to where it is if you leave it behind. The 360 degrees detection tip means the tip part of the pointer will detect all the way around so it allows you much more accuracy when scraping around in the hole trying to locate your target, unlike some which only detect the metal when you are right on the top of the tip. A good long 2-year warranty comes with the XPointer Pro. OK, so not quite as powerful as the Garrett Pro-Pointer AT but it is a low-cost option which will allow you to grab yourself a very powerful and reliable pinpointer. Even better its pulse induction technology! Quest really have done well in such a short period of time to gain such traction and reputation. The XPointer Pro is one of my top 3 pinpointers, I was lucky enough to have a chance to use one for a few days to test and it’s safe to say when I can afford it I will be buying one to add to my evergrowing detecting arsenal. Performance wise you really can’t get more reliable than the XPointer Pro, it’s very powerful and has plentiful features and settings. Quest has created a Pro pinpointer which is very competitive in price and one you won’t be disappointed with. A Metal Detectorist Proposes To His Fiance in the Most Creative & Original Way!